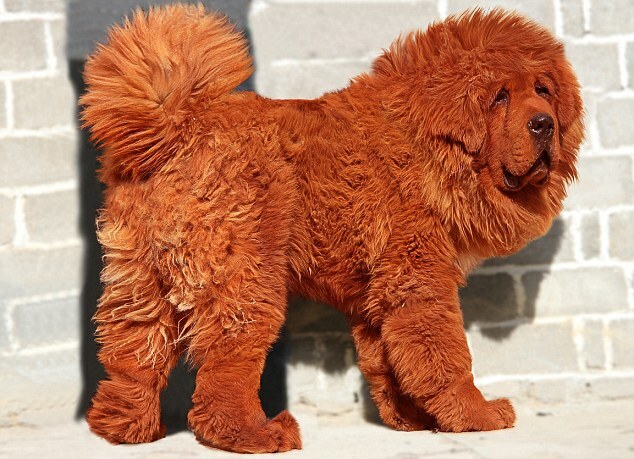 Above is Big Splash, the 11 month old Red Tibetan Mastiff that has been deemed the most expensive dog in the world, having been sold to a Chinese coal baron for $1.5 million dollars. Hey, he’s the same color as Quigley. But his hair is much longer. They say that red is a lucky color in China and that mastiffs are regarded as holy dogs. They are believed to be the reincarnations of Tibetan monks and nuns who weren’t good enough to be reincarnated as humans or to get into Shambala, or the heavenly realm. I’m having trouble understanding why the soul of a failed monk in the body of a dog would be something desirable? Are they expected to work harder in service because they have been demoted to a literal dog house? Apparently these dogs are the new status symbols of the super rich in China. They can grow to weigh 280 pounds, though 180 is more the average. Big Splash already weighs that much, so he’s going to be a big doggie when he’s grown. This entry was posted in Fun and tagged Dogs on March 16, 2011 by Karen Hancock.